Gardens are bursting, market stalls are loaded with colourful produce and it’s time capture the flavours of summer to enjoy through the year. I had the pleasure of joining Teresa Kaszuba and Dan Duran on CHEX TV The Morning Show to chat about some canning basics as we head into the kitchen to pickle those cucumbers and cook up that salsa. 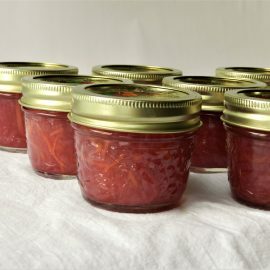 There’s nothing like popping open a jar of summer goodness in the depths of winter to make you appreciate the efforts of preserving the harvest. If you’ve never done home canning before, definitely do some reading before you get started (my book, The Complete Book of Pickling, includes the how-to details and recipes and Bernardin is a good source, too) and choose a recipe from a reputable source that has precise canning instructions. I’ve included a few key safety tips below to get you started. This summer marks 10 years since I spent months and months making pickled vegetables, pickled fruit, salsas, chutney, relishes and sauces day in and day out to create the 250 recipes for The Complete Book of Pickling that was released in Spring of 2009. This summer and fall I’m about to get back into development mode and create some brand new recipes for a new edition to be released next year – so stay tuned! Visit the Robert Rose Books site for my Peach, Jalapeño and Mint Salsa recipe and a link to buy the book. choose a recipe that is designed for home canning and hot water bath processing. If they don’t give you instructions for the hot water bath with a specific processing time that may mean the recipe isn’t safe for home canning and room temperature storage. always use a brand new disc portion of the two-piece lids to make sure you get a good seal. You can re-used the bands but only if they aren’t bent out of shape or corroded with rust. always, always, always (yes! 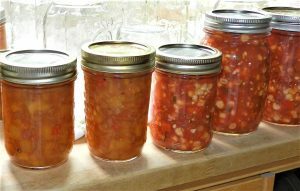 always), process filled jars in a hot water bath (canner) for the specified processing time if you want to store jars at room temperature. It is an extra step, and yes, it’s steamy, but it’s insurance to make sure your jars get a vacuum seal and the contents are heated to a safe temperature and, therefore, preserved properly. The only exception is if you want to eat the food within a few weeks, then you can step the water bath and refrigerate jars right (but don’t store them at room temperature). don’t make substitutions and no ad-libbing – stick to the recipe. Changing ingredients can alter the pH of the product and you may unknowingly make it unsafe. You can alter seasonings (spices, herbs; but not salt) to your tastes but all other ingredients should be carefully measured. You may have old family recipes or find something online that doesn’t have processing instructions, or out-of-date instructions, and you be tempted to use it. Yes, Great-Grandma/Aunt/Uncle so-and-so made these all the time and no one got sick, but we’ve learned a lot about food safety in the last couple of decades so it’s better to use a current, tested recipe to be sure. Remember, we used to ride in the way-back of the station wagon without seat belts in the 70s and we sure wouldn’t do that any more either. I’m on a quest to find the perfect pickling cucumbers this weekend to stock up our supply of Aunt Thelma’s Bread & Butter Pickles. I just can’t enjoy a grilled cheese sandwich without them, and the season for the small, thin-skinned cucs is fleeting. Last year I missed it completely so we’ve been rationing the B&Bs. And I’ll be buying that bushel of plum tomatoes for salsa and chili sauce as soon as I see them. Let me know what you’re canning this season. Tag your pics of jars of goodness with #TheCompleteBookofPickling and let’s help inspire each other while we stock our pantries. 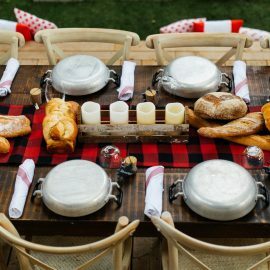 ← Invite Canola to your summer barbecue!